... and boy did I have hopes for this one (see my excitement here). Not to say they have been crushed, ESPECIALLY after one play. But this game is very chaotic. The random event cards can be a bit devastating when picked at the right times. For example, by pure chance I drew a card before the final bidding round which allowed me to make two other players discard 3 adventure cards each. This effectively locked one player out of the last round of bidding and cost her the game. How arbitrary. As well, I kept thinking of games like Ticket To Ride and Elfenland for which this game would share the same audience (and was definitely inspired by). Both of those games seem to have an arc and climactic, nail-biting endings. In this first game, I had played my winning cards by round 14 and couldn't improve my position anymore. I basically sat quiet through the last two auctions before I could claim the win. Hmmm. Having said this, we were playing slow due to it being our first game and so it did seem to go on for awhile. But we were definitely entertained and the artwork is fantastic but I'm just not sure there is enough control or long-term strategy to make this last more than a few plays. I really hope I'm wrong because I could see this being quite a humorous, nasty little game. We shall see. All the best in 2011! What games will you be playing back home this holiday with the family and/or friends? How many new rulesets will your grandma be subjected to? Every year or so for the last little while a game has come out that is deep enough to offer long-term playability but also short enough to be addictively replayable, usually more than once per gaming session. For our group of friends, recent examples of this have been Race For The Galaxy but more so Dominion. Well, I was worried this year but I am happy to say that a game to rival these two modern classics has just been released right before the end of 2010. 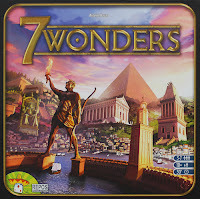 Antoine Bauza's 7 Wonders plays like a cross between RFTG and that great little Japanese filler Fairy Tale but manages to handle up to 7 players without jumping outside of it's 30-40 minute time frame. The mechanics in 7W are hardly original but are put together so well that the resulting experience is quite addictive and absorbing. The entire game takes place over 3 ages in which each player plays 6 turns. 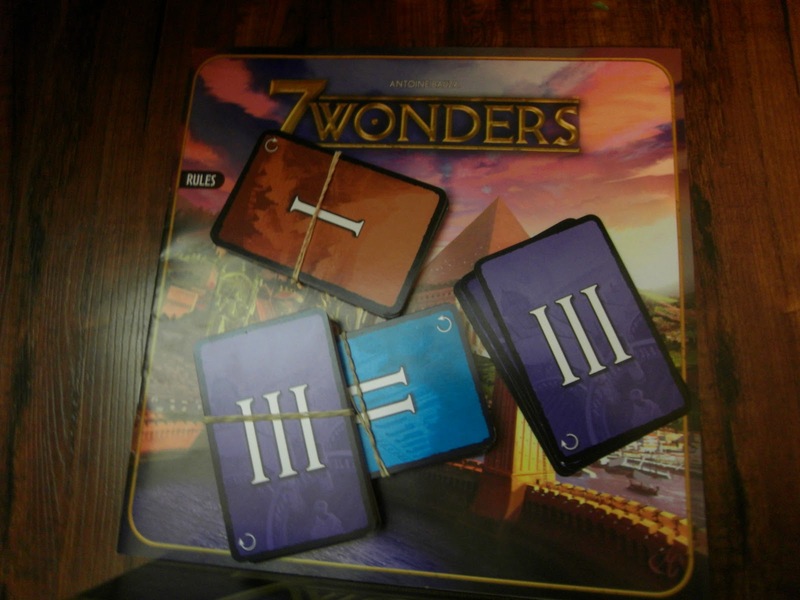 Each player starts with a hand of 7 cards and everyone picks a card to play at the same time. Once everyone has played their card, the players pass their remaining hands to their neighbours (clockwise the first and third round, counter the second). This is repeated 6 times until players play one of their last two cards and discard the other. It's all pretty simple, especially if you've played Fairy Tale. Where it gets interesting is how the cards can be played and their effects on the game. 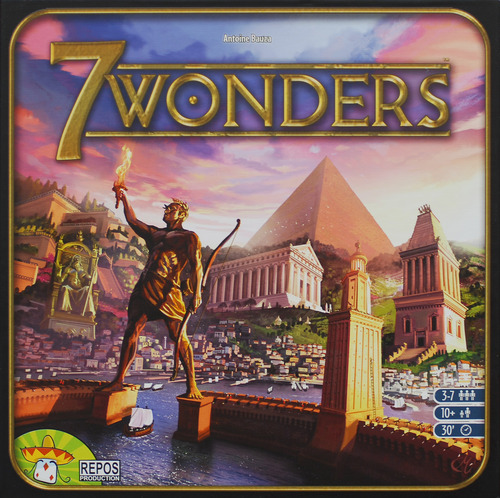 Many cards, especially in the first age, produce one or more of the 7 resources for you once they are played face-up to your tableau. Since you only start with one of these resources and most cards require certain resources to be played, er... "built", one often starts the game by building up resources. And this brings me to the first interesting little twist in the game. You can actually always purchase resources that your direct neighbours have available. So there is often exchanges of money as well as continuous appraisals of the cards laid by one's neighbouring cities. As well, certain cards provide discounts, extra coins, and some even lead to free plays of upcoming cards in later ages. In the final age, a randomly determined subset of the 10 purple "guild" bonus cards show up (think 6-Dev's from RFTG). If you literally play your cards right, you may be able to build one or more of these for an average of an extra 6-10 points each. 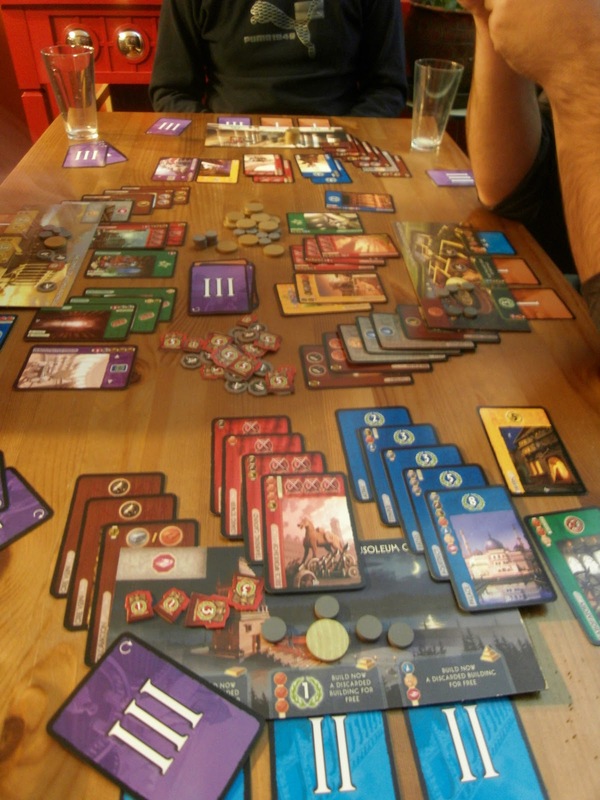 In a game where final scores are usually between 40 and 50, the guilds can often determine a winner. 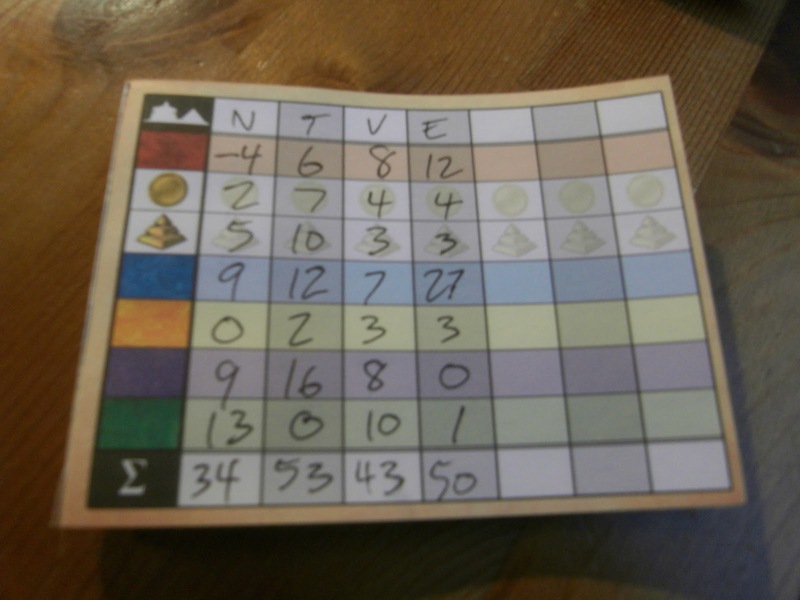 There are also many other ways to rake in points: every three coins gets you a point, building levels of your monument gets you a big bonus, and many of the cards lead to huge points depending on how you play them. As well, at the end of each of the 3 ages every player checks their military might (red cards) with their direct neighbours and points are awarded or taken away according to who is the strongest, lending some much-needed interaction to the game. In a single game, everyone usually plays about 18 cards and all players play them at the same time. So the whole game is over fairly quickly. But that quickness does not imply a shallowness of play. There are many streams to victory in this great little game: heavy military red cards, green science cards, blue culture, or even building certain resources so your neighbours have to pay you tons. 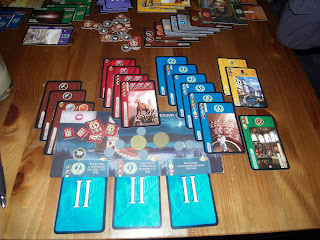 But unlike RFTG where one plays a relatively singular strategy, it seems that players have to construct a more well-rounded city by building some military for protection, resources to help with building and earning money, and then at the same time take advantage of the opportunities that are passed to them. 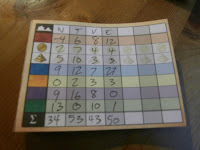 In fact, the game feels a bit more like Agricola in that sense, just without all that agonizing, brain-burning pressure. And herein lies the difficulty that some have with the game. For those who say it isn't deep, I think you're wrong. One can definitely learn the cards and their build patterns and be able to play quite well. But it really all depends what you are dealt and also what is passed to you. And I think this is what actually takes the game from good to great. Players require versatility with their choices and strategy as they don't have complete control of what cards they will end up seeing in their hands. You can plan for a certain card but in the end your neighbour may use it to build their monument or play it themselves. It makes the game feel a little more relaxed and, in my opinion, far more enjoyable. So what do I think of the game? Well, I like it a WHOLE lot. The game is easy-to-teach unlike RFTG, but still has a great amount of depth. It is super-quick whether you have 3 people or 7 people, because your play really only depends on the two players adjacent to you. It's lots of fun, especially when you get that one great card handed to you and actually have the resources to build it. As well, the 7 different monuments have 2 different sides to play with so the starting choices add some real variety to each game. All in all, this may not be my absolute favourite game of the year (I have yet to play Isla Dorada and I have high hopes) but given the play-time and awesome scalability, I think this is probably the best game of 2010. Buy it, I don't think you'll regret it. One of the many joys of having a semi-regular readership of this here blog is that friends and readers (who really are just friends I haven't met yet) send you anything odd they find on the intertubes that is remotely boardgame-related. Thanks to Michaela for mentioning this little tidbit! 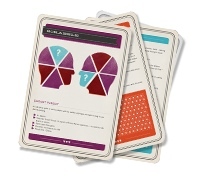 The set of remixes is available in PDF form, a set of rules cards, an Iphone app (of course! ), and soon a good old-fashioned hardcover book. Definitely worth a download if you find yourself spending this holiday at your relatives' place with nothing but their standard collection of drek. I am looking at copies of Bauza's 7 Wonders and Faidutti's Isla Dorada on my kitchen table right now. It's going to be a really fun Christmas... That is if I can stop playing Agricola long enough to get 'em both out of the box! Wanna learn a game about farming? Seriously, it's really easy! 1) Out of The Box Publishing, maker of the lovely '10 Days...' series of games is giving away games to needy kids. All you have to do is go to there Facebook page and hit the Like button. Pretty simple and some kid gets a game for Christmas. 2) Love this. Board Game Family has a great article about what games to give instead of the latest, dumbest version of Monopoly. Did I mention I love this? 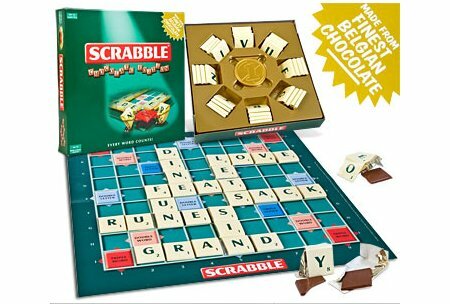 3) I'm eyeing the chocolate versions of various classic board games like Scrabble and Clue. Last year my sister gave me Monopoly which I was more than happy to consume. I think I'll be passing these out to others this year. It seems only appropriate.